The story of the great general Naaman, who was under the employ of the King of Aram during the days of Elisha, is rather well-known – his story of how he was instructed by Elisha to wash himself 7 times in the Jordan river and was healed of leprosy is a story that has been frequently brought up. However, the focus today will be on Gehazi, Elisha’s servant. He first appeared in 2 Kings 4, when Elisha had an encounter with a Shunammite woman. In today’s study we will examine this man and how his greed caused him to sin against God, paying severely for taking these matters lightly. Gehazi, the servant of Elisha the man of God – he was recorded in a total of three incidents in the Bible – the first was the encounter with the Shunammite woman [2 Kings 4:12-36], then the encounter with Namaan [2 Kings 5:15-27], and lastly, an incident with the king who was asking him about the deeds of his master Elisha [2 Kings 8:4-6]. In all the times he was mentioned, it was because of Elisha. My master was too easy on Naaman, this Aramean, by not accepting from him what he brought – we know the story. Naaman brought along with him a lot of wealth and possessions – ten talents of silver, six thousand shekels of gold and tens sets of clothing [2 Kings 5:5]. When Naaman was restored and became clean, he returned to Elisha wanting to thank and reward him, but Elisha rejected it, even upon the insistence of Naaman [2 Kings 5:16]. Imagine this Gehazi, standing behind his master when the offer was made and subsequently rejected? He became greedy. Did Elisha deserve the gifts? Well, most certainly. After all, he did heal Naaman of a terrible disease. Since Naaman had already brought those things, and he brought them specially for Elisha, why was he so foolish to reject it? That was what Gehazi must have been thinking. After all, six thousand shekels of gold was not a small sum of money! Furthermore, his words showed his contempt for this man Naaman, who was not only a foreigner, but also an Aramean. While they were at a time of peace, the Arameans were their enemies. Plus, this guy wasn’t just any random Aramean man. He was a commander of their army! They should have squeezed him dry! They had no need to be exceedingly kind or generous to him. As surely as the Lord lives, I will run after him and get something from him – now, this was a statement of exceeding greed. First, ‘as surely as the Lord lives’ seems like a strange thing to be heard from the mouth of a person whose heart was already set on lying and stealing. Yet isn’t this just perfect evidence that religious fervour does nothing for our faith, if not applied in the right way? Let us be careful not to extol God in one minute and sin against him in the next minute. What do you run after? You cannot have two masters – Matthew 6:24 reminds us clearly that you cannot run after both God and money – No one can serve two masters. Either you will hate the one and love the other, or you will be devoted to the one and despise the other. You cannot serve both God and money [Matthew 6:24]. For the love of money is a root of all kinds of evil [1 Tim 6:10|Article]. Immediately after saying that, Paul reminds that we should flee from all this, and pursue righteousness, godliness, faith, love,endurance and gentleness [1 Tim 6:11]. Indeed, he emphasizes that we should flee the evil desires of youth and pursue righteousness, faith, love and peace, along with those who call on the Lord out of a pure heart [2 Tim 2:22]. 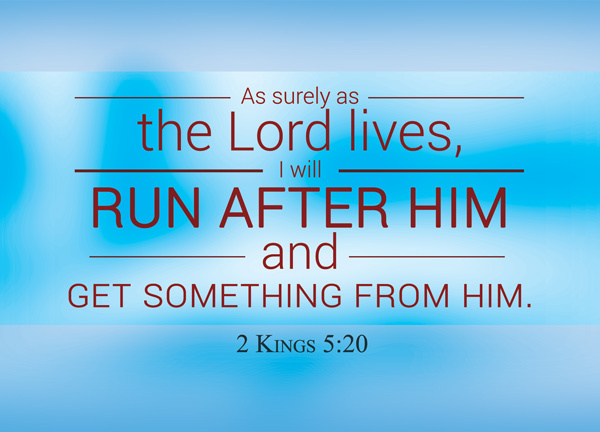 Flee from evil, run after God. Not the other way round. I run in the path of your commands, for you have broadened my understanding [Psalm 119:32|Article]. Did Gehazi manage to get something out of Naaman? Indeed, he did, as we read on in verse 23. However, he also had to lie to Elisha when he returned, in order to hide what he had done – which obviously means that he knew what he did was something that he needed to hide from Elisha – a wrongdoing. In the book of 2 Kings Elisha was often called the man of God, and indeed, Gehazi found out that he cannot hide things from the man of God in a harsh way – his punishment was harsh – Naaman’s leprosy will cling to you and to your descendants forever [2 Kings 5:27]. This is extremely harsh, isn’t it? Just for 2 talents of silver! But this was the price that Gehazi paid, the cost for taking a matter of God lightly. Today we no longer see such harsh punishments being meted out by God. If we lie as Gehazi did, we’re not going to get leprosy and our descendants won’t be implicated. If we lie as Ananias and Saphira did, we’re not likely to be struck down immediately. Why? The answer is simple – grace and mercy of God. God is patient on us, and His patience ought to lead us into repentance, not more sin. However, that doesn’t mean that our sins weigh lesser than Gehazi’s. It simply means that Christ had borne the bulk of the weight of our sins for us already. What do we run after, in life? Whatever we run after, that is our god, whether money, achievements, prospects, romance, possessions. Let us pay careful attention not to sin against the Lord even while we praise and extol him.